The transition from prison to life on the outside can be difficult for anyone, but for older adults the challenge of reintegrating into society is often compounded by the difficulties associated with aging. Historically, prison populations have been comprised mostly of young men, but demographic changes in society as well as changes in sentencing guidelines for some crimes have contributed to growth in the aging populations of prisons. The Bureau of Justice Statistics’ Prison Inmates at Midyear 2009 report estimated the number of inmates aged 55 and older at 110,800, more than twice the number of inmates in that age group from the Midyear 2000 report. Including inmates aged 50 to 54, the estimated number of older inmates in 2009 was 231,500, which was more than 10% of the total inmate population. Severe budget deficits have caused many states to look for ways to reduce their prison populations. Last year, Washington state’s Department of Corrections closed an expensive prison for older inmates, opting to house those inmates in another prison. In June, the Louisiana House of Representatives approved a bill that would make it easier for older inmates to obtain parole. The increasing number of older inmates, combined with efforts to reduce prison populations, has resulted in an increase in older inmates being released. While aging inmates may no longer be considered a threat to society, that doesn’t mean they can easily adjust to their new circumstances. With few social services available to help, the difficulties they face often go unnoticed. Any inmate who serves a long sentence finds a dramatically different world outside the prison’s walls from the one they left. Changes in technology alone, can be daunting; some inmates entered prison in pre-cell phone and Internet days. While life on the outside moves forward, life in prison changes little from day to day. The saying “time waits for no one” doesn’t refer specifically to older inmates, but it may ring more true for them than for anyone else. Elliott, who volunteers at River City Correctional Center in Hamilton County, Ohio, says older inmates have become accustomed to the structure of prison life. Living with much less structure and, most likely, many fewer social contacts are two of the biggest challenges they face when they leave. While younger people are more likely to have some family connections, many older people have few, if any. Even if there are family connections, Elliott says it may be difficult for relatives to accept the person back into the family unit because of lingering resentment or feelings of abandonment. Combined with the difficulties older inmates may have finding employment, they may become isolated, which can lead to behaviors that increase their chances of returning to prison, such as drug and alcohol abuse. As if these challenges aren’t enough, the effects of aging are likely to be increasingly noticeable. Frederic Reamer, PhD, a professor in the School of Social Work at Rhode Island College, says inmates tend to age faster than the general population. A 50-year-old person who has been in prison for 20 years may well have the health profile of a noninmate who is much older. Reamer, who serves on the Rhode Island parole board, says comprehensive discharge planning geared to the needs of older people can go a long way toward addressing issues such as isolation, lack of transportation, healthcare, and the potential need for home-based services, significantly enhancing the prospects for a successful transition to after-prison life. However, since prisons haven’t traditionally had to deal with large numbers of older inmates, they generally aren’t equipped to handle such concerns. 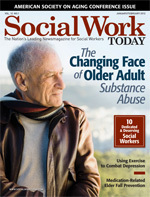 In addition, older inmates can be a difficult population for social workers. Elliott says developing a therapeutic relationship with someone who has lived for a long time in a world where trust barely exists takes time and patience. While race can also be a barrier, age is typically the biggest barrier: Older inmates are likely to question the qualifications of someone they deem too young. To address this issue, Elliott recommends that social work students who are interested in working with this population do their field placements in a correctional setting. For social workers out of school, he recommends volunteering as a way of getting acclimated. The goal, he says, is to understand how the inmate views the world. Once the individual leaves prison, Reamer says there is a need for skilled case management. He says criminal justice professionals need to reconsider how they view certain behavioral issues in light of age-related impairment. Doing that requires a change in the ways people screen, assess, monitor, and respond to older adults’ behavioral issues. For example, individuals monitored by GPS who go outside of their designated boundary may be violating their terms of parole but may also have symptoms of dementia and be unable to recall the restrictions. It’s important for a parole officer to be able to tell the difference. Programs to assist older inmates leaving prison can help them stay out of prison, but there are currently few offerings available. Martin L. Ricketts, LCSW-R, deputy director of rehabilitation programs for the New York City Department of Health and Mental Hygiene, who also works in prison health services at Rikers Island correctional facility in East Elmhurst, NY, says a lack of resources is the biggest challenge in assisting this population. He says assisted living and nursing home care are the main programs available, although many older adults who leave prison end up in the shelter system. New York City does have psychosocial groups designed to support people’s mental health needs while providing an opportunity for them to socialize, but Ricketts says it’s not nearly enough. He says outreach programs can help social workers uncover issues that may not be easily detected, such as substance abuse, HIV, abuse by a caregiver, and improper nutrition and try to find social services that meet the person’s specific needs. The irony is that, with social service funding being cut across the country, the programs that are most needed are the least likely to be implemented or expanded. However, the demographic surge of older inmates isn’t showing any signs of slowing down. States and municipalities will have to decide whether the cost of keeping people in prison is more or less than the cost of keeping them out of prison. In the meantime, social workers will have to make do with what’s available.